Mexico City is the capital and largest city in Mexico. It is also one of the most populous and polluted cities in the world. The Aztec people were here before the Spanish came and made Mexico City. It was founded in 1521 by Hernán Cortés. Today, about 8.5 million people live in the city, and about 18 million live in the Greater Mexico City urban area. The city of Mexico City ceased to exist in 1928. Since then, there is only the Federal District. Mexico City has 18.1 million people. It is the city with the second highest number of people in the world after Tokyo in Japan and just slightly more populated than Mumbai in India. Mexico City was first built in the 1520s after Hernán Cortés destroyed the Aztec city of Tenochtitlan. The Spaniards then emptied the basin of Lake Texcoco to keep it from flooding. By the late 1700s, Mexico City had over 100,000 people. However, there were many slums, which caused epidemics. There were political problems in the mid 1800s after Mexico became independent. More than 40 people ruled in the 40 years after the country became independent. In the late 1800s and early 1900s, electric light and gas were brought to the city. But there was a big difference between the rich western part of the city and the poor eastern part of the city. By 1930, Mexico City had 1,000,000 people. The city kept growing quickly. In 1968, the olympics were in Mexico City. In 1985, an earthquake hit the capital. In the past few decades, there have been problems with crime and corruption. Mexico City has a high population density. It is also surrounded by mountains. This causes problems with air pollution. Sometimes Mexico City gets earthquakes. Mexico City is in the Valley of Mexico at around 2,300 meters (7,800 feet) above sea level. Mexico City its divided by 16 boroughs: Álvaro Obregón, Azcapotzalco, Benito Juarez, Coyoacán, Cuajimalpa, Cuauhtémoc, Gustavo A. Madero, Iztacalco, Iztapalapa, Magdalena Contreras, Miguel Hidalgo, Milpa Alta, Tláhuac, Tlalpan, Venustiano Carranza and Xochimilco. Mexico City was originally built on a lake, Lake Texcoco, which is now mostly drained. The ecology of the area has been much changed by the draining. Many of its native species, such as the Axolotl, are extinct, or endangered. The mountains Popocatépetl and Iztaccíhuatl are nearby. Mexico City is in the tropics. But because its elevation is so high, it has a subtropical highland climate. This means temperatures are warm or mild year-round. It is a lot wetter in the summer than in the winter. Some parts of the city get frost in the winter. ↑ "Secretaría de Relaciones Exteriores – México". Sre.gob.mx. http://www.sre.gob.mx/ligas/info_general/fechas.htm. Retrieved April 17, 2011. ↑ "De la Colonia / 13 agosto de 1521: rendición de México-Tenochtitlan". Redescolar.ilce.edu.mx. http://redescolar.ilce.edu.mx/redescolar/act_permanentes/historia/histdeltiempo/mexicana/colonia/c_coteno.htm. Retrieved April 17, 2011. ↑ "Conmemora la SecretarĂ­a de Cultura el 185 Aniversario del Decreto de CreaciĂłn del Distrito Federal". Cultura.df.gob.mx. http://www.cultura.df.gob.mx/index.php/sala-de-prensa/boletines/2536-601-09-. Retrieved April 17, 2011. ↑ "Senadores por el Distrito Federal LXI Legislatura". Senado de la Republica. http://www.senado.gob.mx/index.php?ver=int&mn=4&sm=4&id=10. Retrieved October 21, 2010. ↑ "Listado de Diputados por Grupo Parlamentario del Distrito Federal". Camara de Diputados. http://sitl.diputados.gob.mx/LXI_leg/listado_diputados_gpnp.php?tipot=Edo&edot=9. Retrieved October 20, 2010. ↑ "Resumen". Cuentame INEGI. http://cuentame.inegi.gob.mx/monografias/informacion/df/default.aspx?tema=me&e=09. Retrieved October 20, 2010. ↑ "Relieve". Cuentame INEGI. http://cuentame.inegi.gob.mx/monografias/informacion/df/territorio/relieve.aspx?tema=me&e=09. Retrieved October 20, 2010. ↑ "Global city GDP 2011". Brookings Institution. http://www.brookings.edu/research/interactives/global-metro-monitor-3. Retrieved 26 December 2012. ↑ "Largest Cities of the World - by population". worldatlas.com. http://www.worldatlas.com/citypops.htm. Retrieved 2008-10-22. Including population within the recognized metro area of the city and also people living in the immediate surrounding area outside of the established border of the city the most populated cities in the world are: 1. Tokyo, Japan - 28,025,000, 2. Mexico City - 18,131,000, 3. Mumbai, India - 18,042,000, 4. São Paulo, Brazil - 17, 711,000, 5. New York City, USA - 16,626,000. ↑ Carlos Mautner (28 April 2014). "Mexico City: The razing of Tenochtitlán and the emergence of Mexico City". Encyclopedia Britannica. http://www.britannica.com/EBchecked/topic/379415/Mexico-City/16417/The-razing-of-Tenochtitlan-and-the-emergence-of-Mexico-City. Retrieved 23 July 2014. ↑ Carlos Mautner (28 April 2014). "Mexico City: The city after independence". Encyclopedia Britannica. http://www.britannica.com/EBchecked/topic/379415/Mexico-City/16418/The-city-after-independence. Retrieved 23 July 2014. ↑ Carlos Mautner (28 April 2014). "Mexico City: Metamorphosis into megalopolis". Encyclopedia Britannica. http://www.britannica.com/EBchecked/topic/379415/Mexico-City/16419/Metamorphosis-into-megalopolis. Retrieved 23 July 2014. ↑ 13.0 13.1 "Mexico: Geography and Environment". http://www.infoplease.com/encyclopedia/world/mexico-city-mexico-geography-environment.html. Retrieved 1 August 2014. 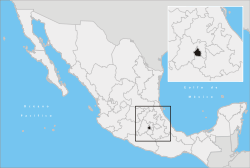 ↑ "Mexico Geography-Information, climate and weather in Mexico". http://www.mexicocity.com/v/geography/. Retrieved 1 August 2014. ↑ "Mexico City climate and weather". http://www.wordtravels.com/Cities/Mexico/Mexico+City/Climate. Retrieved 24 July 2014. This page was last changed on 2 August 2014, at 01:31.